At the recent Eurotek conference in the UK, PADI released more information about its plans with rebreathers. Mark Caney, Vice President, Rebreather Technologies in the PADI Technical Diving Division gave a presentation on the coming range of courses. The courses will be introduced at some time during 2011 and consist of both recreational courses under the PADI name, and a range of technical courses which will form part of the TecRec range. Caney emphasised that courses were still in development, and so subject to change, however indicated the likely layout of the courses would be as below. 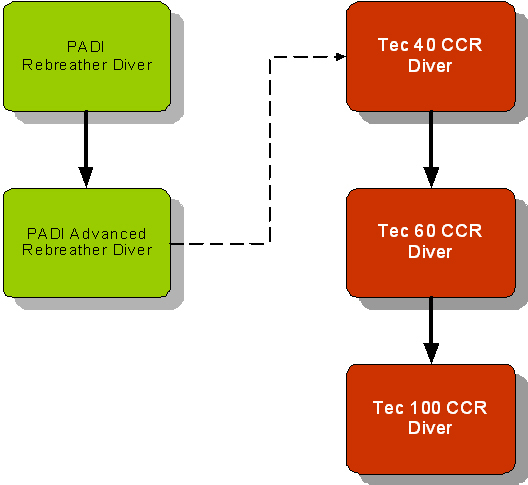 Although some credit will be given for anyone who has completed the recreational courses before entering the technical range, there is no requirement for them to do so, as PADI is treating the two styles of diving quite differently. When asked which units would be approved for these courses, Caney explained that PADI would be designating two categories of rebreather; a Type R for recreational diving, and a Type T for technical diving. A Type R unit will have a high level of automation but relatively limited diver controls. (The Poseidon MkVI Discovery was mentioned as the only unit in production at present meeting these requirements). A Type T will have a wider range of controls for the user but will require significantly more discipline and training on the part of the diver in order to use them in the technical diving envelope. (Most of the current production units could meet the Type T requirements; however, PADI is considering requiring some form of third party testing of rebreather designs prior to approval as this technology is so new and relatively complex). Caney suggested that if any instructors are planning to take advantage of these new courses that they should start to gain experience with rebreathers, as PADI will be expecting new instructors to show that they have acquired a significant amount of experience diving a given rebreather before they can teach others how to use it. Any plans to migrate the Dräger Dolphin SCR in this program? Isn’t the drager already on the PADI program? And what use would it be in the tec one, if you’ve dived on one you wouldn’t want to do any decompression diving on it. How about SCR (pSCR) courses. Will there by some courses for RB80 clones (tens of units out there). Or will that be thru Distinctive Specialty ??? I currently teach on the Pelagian DCCCR by Rebreather Lab…an excellent unit to travel with…at the moment I teach these courses through TDI. So looking forward to see how PADI progresses with closed cct rebreathers. All this is a step in the right direction…I am a little worried on the recreational side that there may be accidents due to poor instruction and maintenence on the Poseidon Mk 6 units which require a lot of looking after…at least on the tec side of things divers are more aware of their equipment and how to maintain it. One thing in the original blog…this technology is not relatively new…rebreathers have been around longer than OC and their basic mode of operation has not changed…I assume that Mark means on the electronic control side of things..